Under France’s presidency there is the opportunity and urgent need for G7 countries to take action to strengthen climate-related financial disclosures. This roadmap is designed for consideration by the French G7 Presidency and the G7 Ministers of Finance and Environment. This short guide by CDSB Technical Working Group member, Dr Jane Thostrup Jagd proposes a two-stage process to create key outputs from scenario analysis to be disclosed within mainstream reports that help investors in comparing and aggregating company data to portfolio-level data. 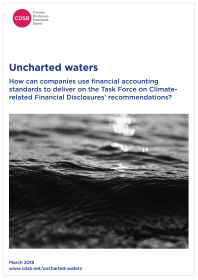 Uncharted waters: how can companies use financial accounting standards to deliver on the TCFD recommendations? This paper focuses on IFRS 7, 9, 15, 17 and IAS 36 and 37, exploring some of the main points applied to traditional financial instruments and how they could help organizations report information about climate-related risks and opportunities in their mainstream report. 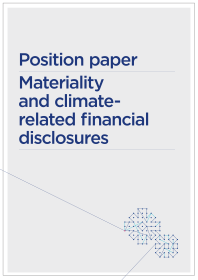 In this paper, CDSB looks at what the TCFD and other mainstream reporting requirements says about the application of materiality to climate-related financial disclosures, trying to understand the main challenges and potential solutions for an effective materiality judgement process. 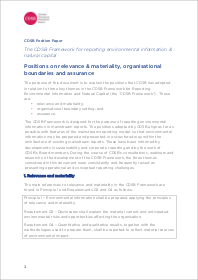 The purpose of this document is to explain the positions that CDSB has adopted in relation to three key themes in the CDSB Framework for Reporting Environmental Information and Natural Capital (the “CDSB Framework”). These are: relevance and materiality; organisational boundary setting; and assurance. 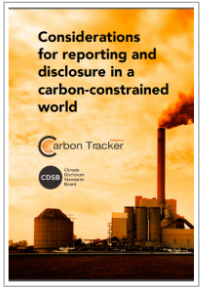 This paper by Carbon Tracker and CDSB is designed to assist the Task Force on Climate-related Financial Disclosures members in assessing the ‘carbon bubble’ concept and ‘stranded asset’ risks inherent in the business-as-usual strategies of many fossil fuel companies. This discussion paper addressing CASRs in mainstream reports proposes both amendments to existing legislation and new requirements to reporting laws, standards and practices. 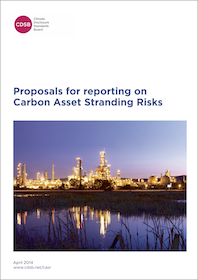 The proposed changes are designed to encourage companies to account for and report in a way that enables investors and other users of mainstream corporate reports to identify, assess and respond to CASRs. 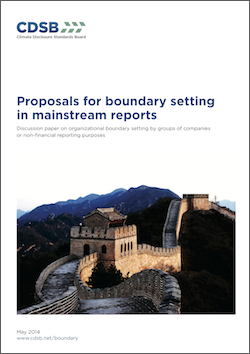 This discussion paper explores the issue of organisations boundary setting for non-financial reporting purposes and offers some answers to the challenges identified.